Almajdouie, a Middle East logistics leader, is this year marking its golden jubilee. Over the years, the company has evolved to become what is considered to be the largest logistics service provider in the Middle East. The integrated supply chain solutions provider boasts the largest infrastructure assets in the kingdom. As a specialist in handling and transporting large and heavy cargo, freight forwarding and terminal and warehousing services, the company is backed by a 6,000-strong workforce, a fleet of 1,800 heavy vehicles and 2,200 trailers and 2 million sq m of terminal and warehousing facilities. In 2014, the company executed a total of 1.41 million freight tonnes of cargo for projects including Sadara, Kemya, Ras Al Khair, Shaybah, Wasit Gas Plant, Tasnee and Ma’aden Ammonia (all in the Eastern Region), Rabigh, YERP, Shoibah, Marafiq, Jeddah South Power Plant and Yanbu 3 (all in the Western Region) and Jizan Refinery and Shuqaiq power plant in the south. “Almajdouie continuously aims to increase its capabilities,” the golden jubilee statement said. The company cited recent partnerships with Interbulk, a leading provider of intermodal logistics solutions, and Swisslog which supplies Saudi Arabia automation and optimisation solutions in warehousing and distribution. In April, Gulf Maritime General Trading & Contracting Company (GMTC), in partnership with Almajdouie, was awarded an $18 million onshore transportation contract for the Clean Fuel Project. The project encompasses customs clearance and transportation of approximately 762,000 freight tonnes of break bulk cargo including 7,750 containerised cargo from port to job site. During the peak season in February 2016 the number of trailers required for transportation is estimated at 2,978. The cargo consists of heavy, super-heavy and very large dimensional units. The longest piece is 80 m, the widest 12 m, the highest 12.5 m and heaviest 850 tonnes. A clear challenge is completing the customs clearance process and deliveries within the shortest possible time under existing government processes and port infrastructure limitations. “GMTC and Almajdouie are looking forward to focusing more in the Kuwait project market and handling projects of bigger sizes in the future. The new alliance is confident that with proper planning and with the support of ministries, ports and customs authorities, they will be able to execute the project successfully,” Almajdouie said. The company took on the challenge of moving three transformers weighing 450 tonnes each and a 395-tonne generator from Jeddah Port to the Jeddah South Power Plant, near Almajdouie Khumra Terminal. There were immense difficulties on the route. The current bridge, which was within the premises of a naval base, had a load capacity of 300 tonnes, while the cargo and trailer weight exceeded it. The solution was to build another pathway over the canal by installing steel plates and beams, while water flowed underneath the steel structures. The plates and beams were removed after the entire cargo passed through safely. “The success of the project demonstrated Almajdouie’s ability to meet deadlines despite the challenges faced,” said the company. 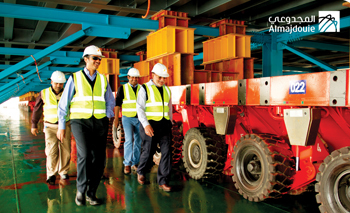 The key factor behind Almajdouie’s retention of valued customers is its reliability and safe approach to each job. In line with this theme, Almajdouie recently launched a brand new safety identity named ‘amaan’ with a view to reinvigorating its safety culture both in the workplace and in employees’ personal lives. “Almajdouie continually promotes a responsible and caring culture with its core components of professionalism, regulation, skills management, incident feedback and continuous learning. As a result, they seek staff vigilance and a commitment from everyone to meet the goals of Corporate Social Responsibility (CSR),” it said. The company’s COO, Khalid M Alghamdi recently won the “Logistics Manager of the Year” accolade in the annual SCATA (Supply Chain & Transport Awards) honours. 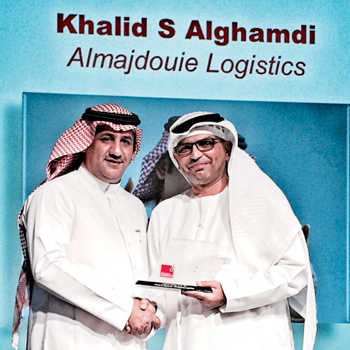 Almajdoluie’s Khalid Alghamdi is a leading and respected figurehead in the Middle East’s logistics industry. The event was held at the InterContinental Dubai Festival City hotel on 22 April and was well attended by the logistics industry, customers, and professional bodies. Alghamdi beat other managers from RSA Logistics, Naffco, Jumbo Electronics, “This year the award has been especially meaningful for Almajdouie as we celebrate our 50th anniversary,” the company said.